U.S. President Donald Trump and Russian President Vladimir Putin arrive for a meeting in Helsinki on July 16, 2018. The relationship between Washington and Moscow has taken on the dimensions of a soap opera, with another breathless week of twists and turns. 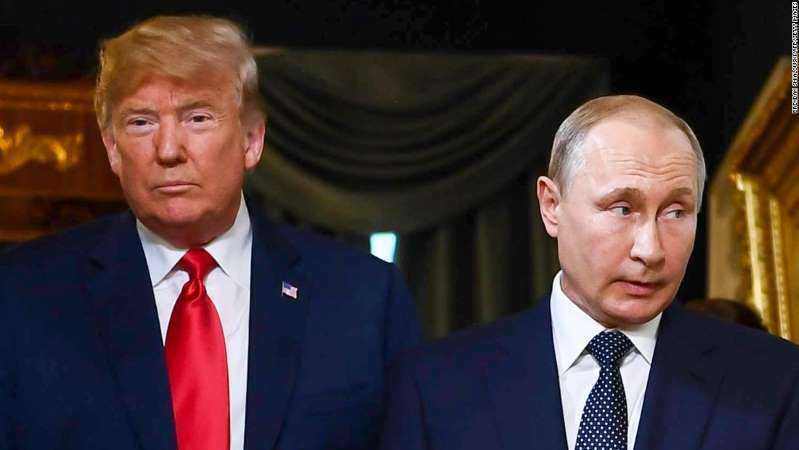 Hope for a better future, the possibility of another Putin-Trump summit, all capped off with the bite of sanctions and another round of recriminations. The week started well enough. Sen. Rand Paul (R) was received warmly in Moscow and suggested more wide-ranging contacts between legislators of both countries. Later, he announced he was carrying a letter from President Trump for the Kremlin leadership that emphasized "the importance of further engagement in various areas including countering terrorism, enhancing legislative dialogue and resuming cultural exchanges." [post_ads]It later transpired that the Senator from Kentucky had asked Trump for the letter in an effort to get a meeting with Putin. Nothing's as it seems in this complex drama. Still, there were other positive vibes. Russian Prime Minister Dmitry Medvedev tweeted on Tuesday: "Relations with the West can be brought back to life. Our partners are coming to see that it is better to be friends." Then on Wednesday, a twist. First, the irritant of a leaked Russian document by a U.S. source to Politico, which set out the Russian position at the Helsinki summit on nuclear weapons talks. In typically florid fashion, the Russian Foreign Ministry spokeswoman, Maria Zakharova, retorted on Facebook: "Before calling other countries (to account) for 'proper' behavior and respect for international law, the United States could set an example and stop manipulating excerpts from closed documents and meetings." And then Russian financial markets began to tumble, with the ruble hitting its lowest level against the U.S. dollar in nearly two years. The immediate cause appears to have been the publication in the Russian business paper Kommersant of what's known as the DESKAA bill, one of several pieces of legislation now before Congress that threatens harsher sanctions against Russia because of its interference in U.S. elections. Indeed, the full title of the bill is "Defending American Security from Kremlin Aggression Act." Shortly before midnight Moscow time on Wednesday came the announcement from the State Department of sanctions over the poisoning of former double agent Sergei Skripal and his daughter in the U.K. in March. The sanctions, which weren't anticipated here in Russia, are mandated under a 1991 law designed to punish any state that uses chemical or biological weapons. The first round of sanctions target so-called dual-use technologies that have civilian and military applications. Under the law, a second round could follow three months from now. A melodramatic response came within hours from Russia's deputy representative at the U.N., Dmitry Polyanskiy. "The theater of absurd continues. No proofs, no clues, no logic, no presumption of innocence, just highly-likelies," Polyanskiy tweeted in English. "Only one rule: blame everything on Russia, no matter how absurd and fake it is. Let us welcome the United Sanctions of America! #SkripalHoax," he said. This fast-moving drama is a microcosm of the U.S.-Russia relationship under the Trump Administration. There are hopeful platitudes from the White House and its allies about the "need to get along." And then the U.S. Treasury, State Department, Justice Department and/or Special Counsel Robert Mueller announce fresh sanctions, designations and indictments of Russian officials, oligarchs and companies. The machinery of government has a remorseless force in applying sanctions based on the evidence it accrues, whatever the President tweets. To some commentators, the mood has worsened since the Helsinki summit after widespread criticism of Trump's performance and the lack of detail about what was discussed. Trump's excessively conciliatory tone (CNN's David Gergen said: "I've never heard an American president talk that way.") made it seem that Putin had scored a major victory. Then came the blowback, as the U.S. Administration sought to appear tough with Russia ahead of the 2018 midterm elections. As the Eurasia Group puts it: "In the wake of that summit, and with multiple bills to vastly expand sanctions against Russia under review in the Senate, Trump was likely more inclined to authorize the new sanctions." Last week Secretary of State Mike Pompeo warned Russia about helping North Korea evade international sanctions and followed up by insisting the U.S. would never recognize the annexation of Crimea. On Wednesday he praised Georgia's "remarkable democratic and economic progress" exactly 10 years after the brief Russian invasion of the country. Medvedev, for all his optimistic noises on Tuesday, said at the same time that if Georgia were accepted as a NATO member it could "lead to a potential conflict, beyond any doubt." On a wide range of issues, from arms control to Syria, there are few if any signs of tangible progress. Add to that the U.S. intelligence community's warnings that Russia is still trying to meddle in the American political process. This empowers Russia hawks in Congress and increases the chances of more sanctions legislation reaching the president's desk. The DESKAA bill, which has bipartisan support, would restrict the purchase of Russian sovereign debt and make it very difficult for U.S. entities to work with Russian energy companies in international projects. It is the growing raft of U.S. sanctions that has the deepest impact in Russia, threatening the Kremlin's inner circle and Russia's biggest companies, from Aeroflot to Sberbank. Russia is taking pre-emptive action to insulate itself. Most notably, it has sold about three-quarters of its holdings of U.S. Treasury bonds, which dropped from $96.1 billion in March to an 11-year low of $14.9 billion in May. Instead, the Central Bank is buying gold like there's no tomorrow. As in the best and worst of soap operas, it's difficult to guess what comes next. The Kremlin spokesman, Dmitry Peskov, said Thursday: "Now from Washington you can expect anything, even the totally unpredictable." Chris Weafer, longtime analyst at Macro-Advisory, says the Trump Administration may be trying to head off tougher measures moving through Congress by acting now on the Skripal affair. But Weafer adds: "The most negative conclusion is that President Trump does not care about engaging with Russia or the outcome of any talks currently taking place. His priority is purely domestic — and foreign relations, such as that with Russia, is simply collateral damage."